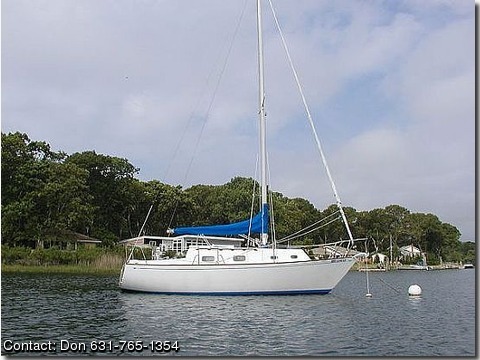 2cylinder fresh water cooled, 2 anchors plow and danforth, 2 auto manual bilge pumps, gps chartplotter cp, head by raritan, 2 sails, alcohol stove, 5 winches, sleeps 5, state registered, 2 batteries ab switch & voltmeter, 2 sailbags, roller furling have in excess of 150' chain, head has a holding tank, steel cradle, icebox, drop down table, sink for galley, sink for the head, foam mattresses, cockpit cushions, , mainsail cover, Wempe barometer & chronometer, S/S bow & sternpulpit,alcohol stove, This is a sailboat of rugged construction with a smart hull design and layout.It is an ideal coastal cruiser or day sailer,that is stiff in the wind and comfortable under all conditions. A large cockpit ideal for 2-4 persons,but easily sailed solo.The boat has been well maintained,but serious health issues dictate its sale.Over the past eight years I have immensely enjoyed sailing the waters of eastern L.I. (North Fork),we have consistant winds and a great expanse of sailing distances- incl-uding Block Is. Sound,etc.Although I particularly enjoy sharing my pleasures with family and friends, most of my sailing is solo.The hull design allows a good heel,but with the reassurance of stability.The Furlex furling system allows for ease in reducing sail area,as well as reefing the main. In this area we have an excellent source of professional marine services.Albertson Marine,Southold, is my primary care and service site, but have used Brewer Yachts,Greenport,also, where last winter my mast;rigging and furling gear were serviced.She is a fine, mature young lady.